I made it to the Taj! 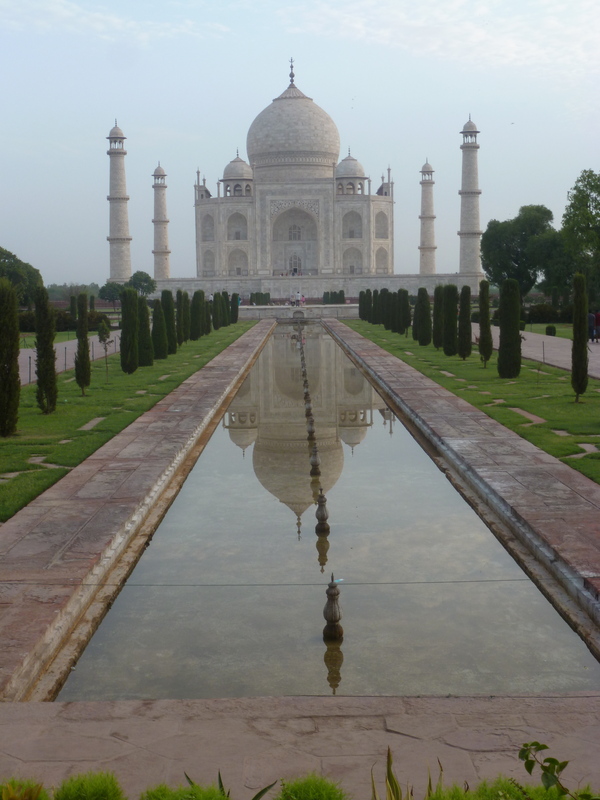 This past semester I took an art history class that briefly touched upon the Taj Mahal. The projected images my professor put up for us in class looked so beautiful that I could only imagine what it must look like in person. There is no denying that being able to see the Taj up close and personal was what I have been looking forward to most this entire trip. Never would I have foreseen the struggles I had to endure just to make it to Agra. Our flight to New Delhi was scheduled to leave early Monday (June 18th) morning, and then we were to hop on a bus for a 5-hour ride to Agra, where we’d spend the night and see the Taj in the morning before heading back. Most of us planned to stay up the night before our flight because it was our last night in Mumbai and we figured we could just pass out on the plane. However, my night took a turn for the worst when I wasn’t staying up to bond with new friends but rather to get sick and spend every half hour running to the toilet (I apologize if I’m putting graphic images in your head). When four a.m. rolled around and we had to head to the airport, I was feeling worse than ever. I truly did not think I would make it to Agra, but I knew I had to try. At the airport I was in tears because I couldn’t fend for myself nor could I walk anywhere without making sure I had a bag to vomit in. Once I conquered the flight to Delhi, I kept telling myself that only one bus ride stood before me and a warm, comfortable bed that would rescue me from this miserable sickness. With my professor by my side to tell me what to eat, drink and to maintain positive thoughts, my friends putting a smile on my face no matter how awful I felt, and the faith I had in myself, I made it to Agra and finally got to lay down. I was not going to let anything get in between me and seeing one of the most magnificent structures ever created. When I was finally able to look at the Taj, basking under the sunrise just passed the reflection pool, tears came to my eyes. All I could think about was how just 24 hours earlier I didn’t think I would even make it to Agra, let alone get to see the Taj. Every couple of steps we were snapping another picture, god forbid we forget to get the Taj at a different angle! All jokes aside, it made me so happy that I was not only able to have my own pictures of the Taj, but be physically present in them too. 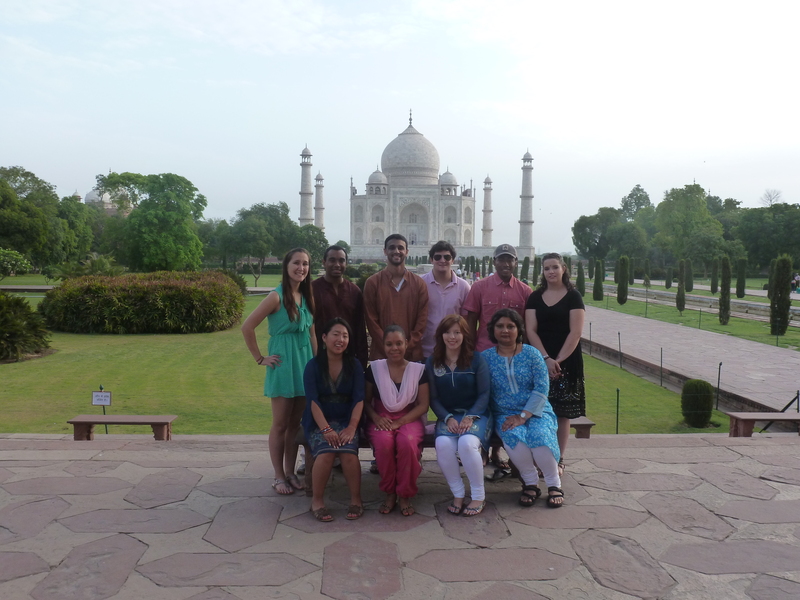 Without these people, I would have never made it to the Taj! The Taj Mahal took 22 years to build. That seemed like a long time to me but after noticing the intricate carvings and endless details of the structure, I felt that 22 years was pretty short. The whole experience was surreal. Everything was so beautiful and the circumstances could not have worked out more nicely. Thanks to some will power and the kindness of others, I made it to one of the Seven Wonders of the World, and I assure you, it did not disappoint. I really hope I make it back there someday soon. I plan to take as many friends and family as possible because the Taj leaves you at a loss for words. Describing it to someone does not give it justice, you have to see it in person. The title of my post is a quotation from one of my favorite movies, Up. I think this pretty well defines my last few days in India. Everything was so new, everything was an adventure. After getting off the plane in New Delhi, we boarded a bus to Agra. Even the 5-hour bus ride was full of new experiences. We saw countless monkeys running on rooftops, peacocks chilling on pipes, and cows, goats, and dogs lounging on the side of the road. The bus made one pit stop. During the 20 minutes we were off the bus, I experienced what might have been a minor sand storm and had a cobra held about a foot away from my face. After arriving in Agra, we cleaned up a bit and then toured the Agra Fort, which was beautiful, massive, and really interesting. The attention to the smallest details amazed me. From a high point in the fort, we looked across the river at the Taj Mahal, getting a sneak peak of what we would see the next day. On the way into the fort we saw another exotic animal: parrots. That night, we explored the hotel. Danielle found this crazy field with marble horse statues, which we of course mounted and took pictures on. We then toured the inner facility, finding all it’s ins-and-outs. After that we went on the roof and looked over the entire massive complex filled with fountains, gardens, and a pool. The next day we awoke incredibly early to see the Taj in the morning light. The Taj Mahal was breathtaking. Even though I was tired, hungry, and already sweating, I was amazed at how beautiful the Taj and surrounding gardens were. I can’t even believe the amount of work that went into building it. Our tour guide said it took 22 years and 20,000 workers. I now understand why it is considered a wonder of the world. Every tiny detail was thought of, and it was entirely symmetrical. 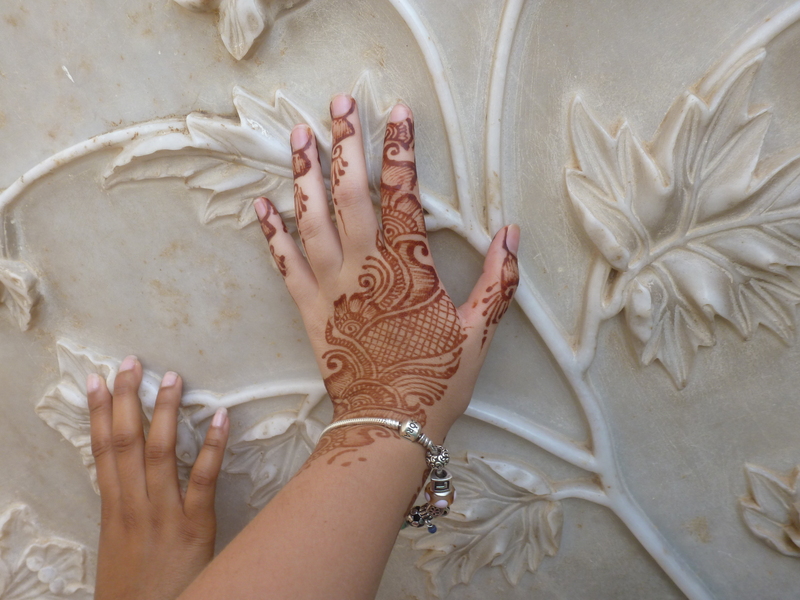 After the Taj, we saw how exactly the fine stones are shaped and put into the marble. I actually got to try the stonecutter. It really made me appreciate the incredible effort that went into making the Taj. The emperor that had it built wanted it to represent a heaven on earth, and it truly resembles that. Of course, getting home was an adventure of it’s own. The bus had some trouble, so we were stranded on the side of the road for a while. We also didn’t quite make it back with everyone’s luggage. I can’t believe the trip is over already. Its still so surreal being home. I want to give myself a few days before I post my final blog post about the differences and what I miss most about the trip. Until then, Namaste.